Videos showing step-by-step how I paint my pictures. People have asked me about the painting. And I have been able to point them towards a recent video that I made showing the whole painting process. In fact there are two new videos on www.colinruffell.com showing two original paintings from blank canvas to finished picture. 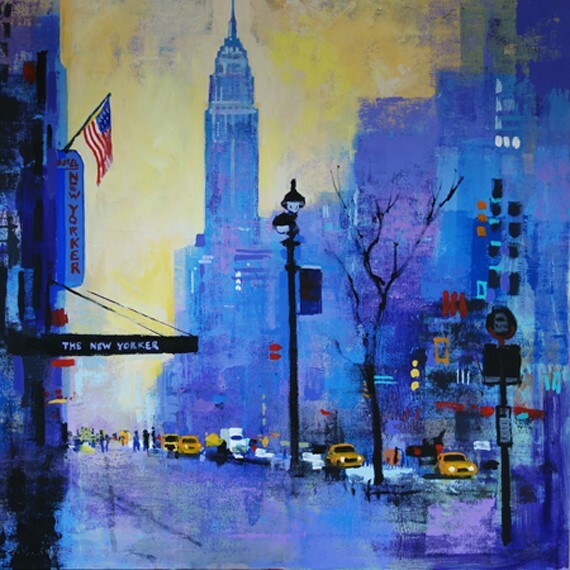 So the first one, titled ‘NY34ST’, is about the painting that was destined for an international oil company. They have Grosvenor Square offices in Westminster London where the original painting now hangs in a board-room that boasts a New York theme. I chose, and hope that you agree, a bit of Gershwins ‘Rhapsody in Blue’ as an appropriate choice of music for this four-and-a-half minute video. I have ‘self-published’ NY34ST as a print on paper or canvas. The second original painting is titled ‘NEW WORLD LONDON’. 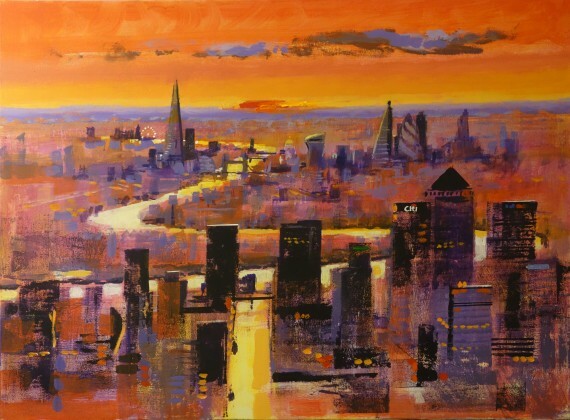 It was commissioned by a Ruffell collector who asked for a bright warm picture celebrating the financial impact of the City of London and its status as a cultural magnet. The five-minute video ends with a quick shot of the finished painting in the collectors living room with a glimpse of a second original Ruffell on another wall. Music this time is from the New World Symphony by Dvorak. We may publish this one too, one day. Fellow artists, fine art dealers, and collectors have previously admired other so-called ‘Ruffell-in-action’ videos showing method and thoughts from first stroke to final varnish. These new videos show how the painting develops, changes, evolves and comes together. You see ‘happy accidents’ and ‘scary moments’. Happy accidents are where the result of a quick or loose paint action inspires a new idea in an artist, and scary moments are where the artist risks all by doing something drastic such as an overall wash of strong colour. Only he knows this will be calmed down later in the process. Hopefully. 50 YEARS AS A PRO.